It will be a WEATHER ALERT night tonight and again from about 4-8PM Thursday. These are the timeframes for large and potentially severe storms to rumble through the region. Many areas will get some rain…some will get some strong gusty winds of 60-75 MPH…some will get some rather large hail…potentially golf-ball sized plus…some will deal with flooding concerns…and while the potential of a tornado is there…this appears to be the lower of the risks but again there could be a couple in the viewing area as well tonight especially. There are many moving parts to this forecast…and how this all plays into what happens tomorrow for School Day remains to be seen but we continue to have rain concerns for the program, needless to say. Tonight: Storm timing is roughly from about 8-12AM or so for the KC Metro area…earlier for NW MO and NE KS…for areas farther south and east, let’s see how well the storms hold together. Your timing appears to be roughly 9PM-2AM or so. Severe weather risk is elevated tonight. Yesterday there were some pretty huge supercell thunderstorms across mostly north central KS. There were roughly 7-15 tornadoes as well…with a couple of biggies in the rural areas. Some of the pictures/videos are pretty impressive to look at from a distance. By far the most impressive tornado was this beast that was towards the Bennington/Tescott area of KS. There were other tornadoes…and there was one in Oklahoma as well…the 1st of the season too. Note the location of all the tornadoes and the vast majority of hail reports…there were some monster sized hailstones out there as well…some reports of over 4″ chunks! Reed Timmer, who’s scheduled to join us on Thursday for School Day was chasing yesterday as well…and he caught that behemoth too! The storms weakened considerably as the approached northern MO late last night…although they still created a lot of rain and helped the northern MO rain situation. KCI had 1.36″ of rain from this…and St Joe ended up with .62″ overall yesterday and this morning. The set-up today is not that different from yesterday. The main features to trigger convection remain well west of the KC region…and that’s where we expect storms to re-fire later today and move towards the ENE. The main thrust again appears to be towards NW MO initially with the activity then moving into the KC area. The storms that fire well to the west will be moving over a lot of territory before they get to MO…let’s see how strong the end up being by the time they reach our area. I do want to bring up the forecast for yesterday…strictly from a local angle. This is the reason why I didn’t show the forecast from SPC in yesterday’s blog. While it was extremely good for north central KS…I wasn’t happy with how far northeast they were carrying the higher threats. From the storm reports map above…there wasn’t anything noteworthy close to NW MO. It was an excellent(!) tornado formation forecast…it was way too aggressive for the severe weather risks towards the NE of the tornadic storms. See how the reports verified very nicely (especially tornadoes) in the areas towards north central KS…but notice the lack of anything in NE KS and NW MO…that was always the suspicious part of the forecast for me and why I didn’t use it yesterday. Let’s see how that moderate risk winds up today. The storms will be entering a region close to the state line with instability…they should arrive closer to 9PM instead of 1AM…so there should be more instability for them to work with as they come into the region. Also of note is the increase in wind speeds (speed shear) as you go up into the atmosphere and also the changing of wind direction from the due south to the southwest as you go higher up as well (directional shear). This may allow the storms to maintain at least the severe level strength as they get close to the KC area. Of the 3 main threats…hail/wind/tornadoes…wind is the biggest worry. Those are VERY significant severe criteria wind probabilities. As far as tornado probabilities go…also noteworthy…but perhaps more focused towards the SW of the region. I’m NOT saying there won’t be any tornado warnings somewhere in the viewing area tonight…I’m saying that the chances aren’t as high as getting storms that produce damaging winds tonight…and hail as well. 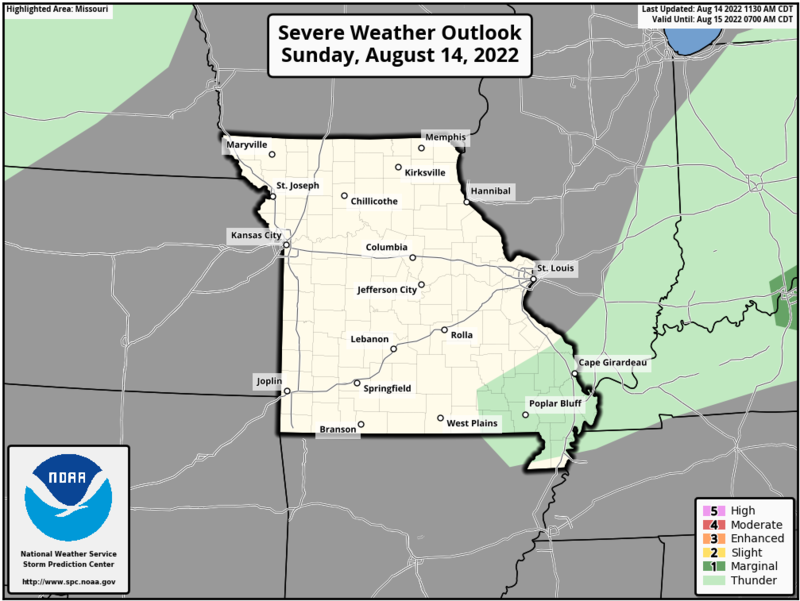 Again be sure to watch the weather carefully tonight after sunset especially in the KC region…perhaps earlier in NW MO. One way to watch the instability increase today…is by looking at a product that we call CAPES (Convective Available Potential Energy). It’s important to note that a lot of instability doesn’t mean a lot without a trigger. The trigger out west this afternoon is going to be a cold front/dry line. More on that in the 2nd blog after 3PM or so. The following map will update automatically. The blue areas represent a “cap” which overlayed on the capes means that there is still a lid on the atmosphere preventing towering clouds from turning into thunderstorms. The morning surface map shows a cold front, farther east than yesterday’s map I posted…that really is about stationary I think. There is a developing dry line that is down towards northeast NM as well. That will “firm up” as the day moves along and come out into the southern Plains. Hence where the dry line/cold front and a small area of low pressure are co-located (the triple point) we watch that general area for a better chance of tornadic storms. That area, illustrated in the tornado forecast several maps up…is where most of the chasers may focus. On a final note…flooding concerns. There is a tremendous amount of moisture in the atmosphere. The dew points here at the surface are elevated (not that high but high) and while there will be decent individual storm movement…there may be training thunderstorms in the KC region later this evening. This means that there is potential for 1-3+” of rain in the area overnight. Be alert to this as well. Cary Bahora was out on the massive twister in north central KS. The NWS in Topeka will be surveying the damage (minimal) to rate that tornado this morning. He has our feature photo for this blog. Do you think the risk for damaging winds and/or hail is higher for tomorrow afternoon rather than tonight ? What about rain potential both days. I see the SPC shifted the moderate risk east to include all of the metro, and the tornado risk hatched area expanded to just west of town. Thoughts? Thank you as always for your measured and informative blog posts. You are my go-to on days like this. Looking forward to the second blog and any further updates as the storms get closer. Are you having troubles finding hail damage leads? Let stormplotting.com provide you with interactive hail mapping solutions that will improve you bottom line.